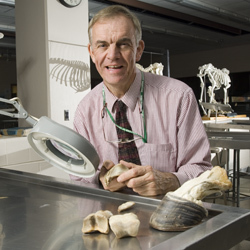 Professor Bowker heads up the Equine Hoof Laboratory at Michigan State University. His work and his teams work there has thrown new light onto the functions of the hoof and its internal components and their relationship to soundness. His research has lead to a greater understanding of natural hoof care as a powerful rehabilitation tool. This science is backed up by the now thousands of successful rehabilitations for serious hoof problem such as navicular syndrome. He explains that we are living in unusual times and professionals working in hoof care need to "catch up" with those working at the coal face of hoof care. Have we seen so many unhealthy hooves for so long that we no longer recognise the causes! Its time we fast tracked this information. The Equine Hoof Laboratory at Michigan University is the home of much of the new research into the hoof. From their work we are only now beginning to understand the true nature and biomechanical functions of the hoof and its internal components. The articles below, are written by Andrew Bowe Master Farrier, Equine Podiotherapist and a Director of the Australian College of Equine Podiotherapy. Andrew was the first farrier in Australia to realise that barefoot rehabilitation was the very best option for the horses in his care and to adopt this new craft. He changed after 25 years of traditional farriery so he has really seen hoof care from both sides of the anvil! Andrew & and wife Nicole run Mayfield Barehoof Care centre - Australia's only full time rehabilitation centre for Laminitic and Navicular horses. He travels Australia holding barefoot workshops and seminars and asks that vets and farriers contact him if they would like to know more about his strategies for barefoot rehab. Veterinarians - like to know more about ways to achieve a more successful outcomes with rehabilitation? Consider new strategies for serious hoof issues such as navicular syndrome? Professor Robert Bowker visits Australia regularly to lecture to students studying Equine Podiotherapy at the Australian College of Equine Podiotherapy. He also offers seminars whilst he is here featuring his research work. Professor Robert Bowker is one of the leading reserachers into the function of the equine hoof. His studies, right down to cellular level of the structures involved, have produced some outstanding observations about how the hoof. His research has thrown light on some of the long standing myths surrounding traditional hoof care and offered insights into how we can easily rehabilitate serious hoof conditions that were once career ending for equines, such as navicular syndrome. His work has also revealed the relationship between healthy hooves and healthy biomechanics, and how both can become dysfunctional when the hoof is unhealthy or under influences that impact on its ability to be self maintaining. Bob has a deep love for animals and a particular interest in horses and his studies have helped explain many of the amazing changes to the equine hoof that natural hoof care is revealing all around us at the moment. Robert Bowker grew up in northern New England before going to undergraduate school in Massachusetts and then on to veterinary school at the University of Pennsylvania, where he met Barb. Following graduation he continued his studies in neurobiology, receiving his PhD and continuing on at several major universities in the U.S. His research interests in horses began in the early 90's when he began focusing upon understanding how nerves aid and improve foot function, how horses use the many sensations present in the foot to negotiate within its environment and how the foot dissipates energy and supports the horse during health and disease conditions. He has presented his results to numerous international and national audiences over the past ten plus years. He enjoys teaching vets at Michigan University and lecturing for interested groups about the equine foot as he believes that a healthy foot translates to a healthy horse. Linder K, Van Wulfen KK, Perry RL, and Ocello PJ. sensory nerves and neurovascular bundle. Eq. Vet. J.
DV, Bowker RM, and Robinson NE. Tachykinin receptors in the equine pelvic flexure. Amer. J. Vet. Res. 29:306-312, 1997.
hypothesis of energy dissipation. Amer. J. Vet. Res. substance P binding sites in equine airways. Eq. angiography of the feet of horses. Amer. J. Vet. Res. ligaments. Amer. J. Vet. Res. 62:414-424, 2001.
tendon on the distal phalanx in healthy feet of horses. Amer. J. Vet. Res. 63:222-228, 2002. Amer. Assoc. Eq. Pract. 49: 146-168. Contrasting structural morphologies of "good" and "bad"
footed horses. 49th Amer. Assoc. Eq. Pract. 49: 186-209. Bidwell, L.A. and R.M. Bowker. stratum internum of the hoof wall from the fetal. Newborn and yearling horses. Amer. J. Vet. Res. Bowker, R.M. and E.E. Haas. Foal Occurs by Keratinocyte Migration From Laminae. Amer. J. Vet. Res. (submitted). three-year-old racing Quarter Horses. Amer. J. Vet. Res.